This is an excerpts from reminiscence published in the book meant for Std. V.
15 August 1947 was the day India became a free country. The Birtish Empire came to an end and the Indians were no longer under their rule. This is how three different people remember that time. The dream had begun at 11pm on 14 August 1947. All our leaders were gathered in Assembly Hall. It was a huge circular, wooden paneled room. My friend’s father managed to find a place under a fans hung from long rods. All the fans hung from long rods. He said it as a bit noisy because of that. Vallabhbhai Patel, J.B. Kripalani, Sarojini Naidu, Baldev Singh, Abdul Kalam Azad, Jawaharla Nehru-they were all ther. Lord Lois Mountbatten and his wife were also there. He was the last British Viceroy He was invited y the new government to be Governor General of India. First, Sucheta Kripalani sang Vande Materam(the National Song of India). Dr. Rajendra Prasad, who became the first President of India, asked us to pray for all those who laid down their lives for India’s freedom. Then it was the turn of Jawaharlal Nehru to speak which is known as “Tryst with Destiny”. The Sacrifies of all those who fought for India’s independence will never be forgotten. Like, for example, Kanakalata Barua. It was 1942. Indians had only one message for the British- Quit India. Kanakalata lived in Barangbari, in the Sonitpur district of Assam. When Gandhiji. 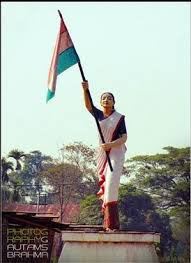 And others asked the people to hoist the Indian flag wherever they could. She also wanted to do so. She led a small group of men and women to the local police station. They wanted to hoist the flag there. “Do not come closer! We will shoot! “ a police officer shouted. “ You do you do duty and I will do mine,” Kanakalata replied and marched on. The police fired. Kanakalata was the first to die. She was eighteen years old. An that was how freedm was won, with courage and faith that one day Inida would be free. If the Indian people kep that faith, the Indian flag will always fly high. As the people set of on long journey to cross the newly-drawn borders, something bad happened, especially in Punjab and Bengal. Some groups from either side began to attack each other. It was a time of madness. For some other notes please click HERE .